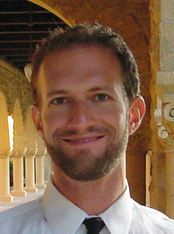 Assistant Professor Michael Rotkowitz (ECE/ISR) is the recipient of a 2014 National Science Foundation Faculty Early Career Development (CAREER) Award for "Decentralization and Parsimony for Implementable Control of Massively Interconnected Systems." The five-year award is worth $400,000. The advent of complex interconnected systems has created a need to design and analyze controllers that can observe information from only a small portion of a network but may ultimately affect a large portion of the network. This includes smart building management, multi-vehicle systems and convoys, irrigation networks, large array telescopes, and the power distribution grid. Developing these kinds of controllers is a key challenge in many cyber-physical systems problems. Conventional controls analysis assumes that one centralized decision-maker can access all available measurements, and determine the usage of all possible means of actuation. Most methods of design and analysis are extremely fragile to this assumption, and break down when such centralization is not possible or is not desired, leading to the field of decentralized control. There is currently an enormous disconnect in decentralized control between celebrated theoretical advances and the concepts that are used for implementation, or even for computation. This is true of both recent advances and more classical results. Rotkowitz’s project pursues the key reasons for this disconnect, along with other impending barriers to the systematic implementation of decentralized control theory, particularly those which will become disabling when applied to massive systems. It undertakes theoretical investigations targeted to advance the field in a manner from which those barriers can be eliminated, along with much farther-reaching benefits, further coupled with computational and algorithmic investigations designed to parlay past and future advances into enabling technologies for sensitive applications including those listed above. Rotkowitz’s research will produce a novel synthesis of the theory and methods of parsimonious recovery, which has undergone dramatic recent developments, with both the classical results and modern advances in decentralized control. It will further broaden the applicability of elegant and useful aspects of optimization theory to classes of problems that are paramount for the main scope of the project. The fundamental advances pursued in optimization and estimation have the potential to be of use much more broadly and to impact many other fields. This project further seeks to make broad impacts outside of its primary domain through collaborations with industry and with experimentalists, and through the creation of software tools for widespread use by non-experts.